The power of human resources is the strength for every company. In banking and financial institutions, a competent human resources is a fundamental need. Especially in this rapidly changing world of technologies. Every banking and financial institution will have a continuous need to train and develop their human resources on new processes, financial instruments, technologies, and many other skills and projects. As we all aware, the main goal of banks is to serve the customers better. The information regarding the products and projects need to be taught to the employees – especially to the sales persons in an effective timeline. This process can be made easy through e-learning, a method where the bank’s employees can get the information immediately. E-learning provides a method of training the human resources with the help of advanced technology. While the bank employees have tight schedules, e-learning would save a lot of time both for the management and the employees. E-learning enables the company to easily compile the content structures and deliver it to the employees, so they could learn at any time and from anywhere. Teaching employees of new skills could be done in a fun game. Gamification elements such as awards, badges, leaderboards, progress updates and integration with social media could be an interesting points for employees to complete their e-learning especially if it’s packed in a fun & engaging game mechanic. Story-based learning with linear narrative and scenario. When presenting a dry / repetitive information, story based eLearning can help to engage trainee while helping the to remember the content with a well prepared narrative. Story-based contents feature a fictional storyline with a beginning, a middle portion and an end would be a good way to make the learning progress enjoyable. While a story may have multiple sub-plots, the company must keep the scenario focused on the content. Online discussion are different from traditional face-to-face course. Even though each trainee know each other’s name there is anonimity in online discussion, encouraging trainees to take risks. With online discussion the content will feature discussions and analysis of dynamics storyline through a variety of different trainee’s perspectives. The content will be based on several questions and answers, where trainees will be tested to choose their own answers. Explanation and possible scenario with the chosen answers can also be provided to help with the learning experience. Case study/master scenarios featuring real-world situations and examples, also featuring guided exploration and active learning. Just like a school teaching method, trainer can create learning activities where trainees are presented with a scenario or problem that they must work through to achieve their goals. WGS has worked on several banking and financial institutions, and from our client’s testimonials we are proud to present the technology that will give plenty of benefits for banking industry. Not only it is cost-effective, convenient to users, but also can be accustomed to every trainer. E-learning can be used to enhance the IT skills of banking employees to make them more efficient, updated and comfortable with technologies. 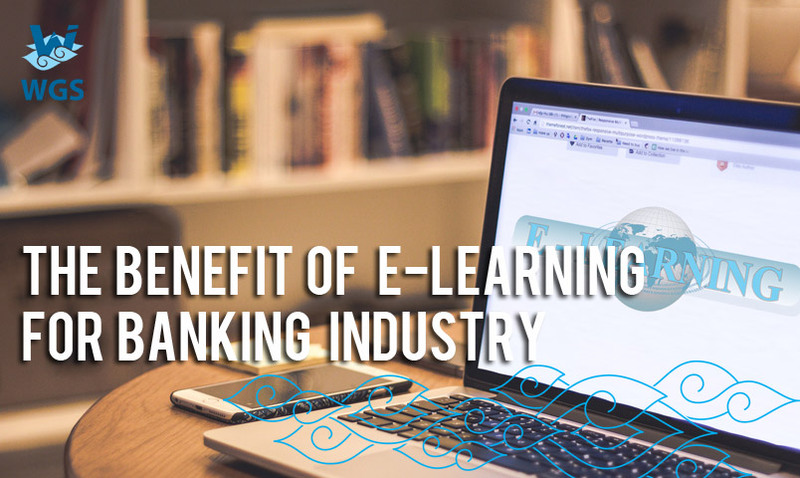 Efficiency and practical use of e-learning can be a good solution for banking industry to enhance their human resource quality. This can be a good consideration for the industry, especially when we must compete with the other tech developments in the near future. Tell us your thoughts about this e-learning system in your company, and we are glad to discuss it with you.